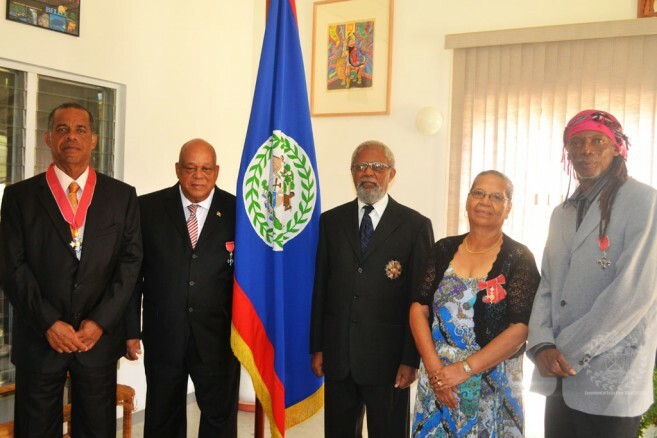 Four Belizeans were today honoured at the Belize House for their selfless and outstanding contributions to Belize. The honourees included Senior Counsel, Mr. Denys A. Barrow, who was awarded the insignia for Commander of the Most Excellent Order of the British Empire for his distinguished service to Belize and the field of law; Commissioner of the Supreme Court and Senior Justice of the Peace, Mr. Patrick Alexander Bernard, was bestowed with the insignia of a Member of the Most Excellent Order of the British Empire for his dedication to the Public Service. Also receiving the insignia of a Member of the Most Excellent Order of the British Empire were Mr. Pen Cayetano for his wonderful and numerous contributions to music and art; and Senior Justice of the Peace, Ms. Crispina Hyde, for her selfless service to education and community. The Governor General of Belize, Sir Collville Young, conferred the prestigious honours to the citizens on behalf of Her Majesty Queen Elizabeth II.